The Healthcare Information and Management Systems Society conference this year provided healthcare professionals with even more than in years gone by. HIMSS 2015 was bigger and better than ever and attendees got more opportunities to learn, discuss and debate the current issues facing the healthcare industry. HIMSS also published the data from the 2015 HIMSS Mobile Technology Survey. The survey asked questions of 238 respondents’ use of mobile technology as a method of engaging patients in their own healthcare. The results indicate that healthcare professionals are taking great strides to embrace new technology and communicate with patients in a format that they are comfortable with using. According to mobile usage data from the Pew Research Center, in January, 2014, 90% of Americans owned a cell phone and 64% owned a Smartphone. 81% used the devices to send or receive text messages, 60% for internet access and 52% for sending emails. 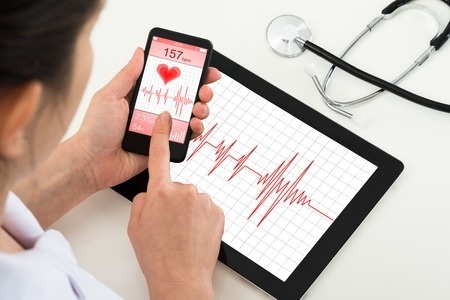 The explosion in mobile usage has been rapid and the healthcare industry appears to be keeping up. Not only are telehealth services now being offered because the patients want to communicate in convenient ways, healthcare providers are finding that it can help to cut operational costs. IMS Research subsidiary, InMedica, recently published a report on the use of wearables which strongly suggests that telehealth is helping to reduce costs. Its researchers predicted with this driving the market, it is likely to increase by six times over the course of the next 2 years. The 2015 HIMSS Mobile Technology Survey also confirms this, with respondents indicating that their employers were not only save costs but also improve patient care. Respondents indicated that preventative support care had improved (24%), telehealth interventions had increased (23%) and their employers were able to make better use of their resources (21%). Overall, 54% of the survey participants said that their organizations reported a cost saving as a result of mobile technology. However, many healthcare providers may not yet have realized the benefits. Only 18% said that the mobile heath technology environment was mature. There is, after all an initial cost to absorb to develop the necessary mobile health services for patients. Just over half of the respondents indicated that it was the cost of implementation of new mobile technologies which was proving to be an issue and had either prevented or limited development in the area. That said, those who had implemented the technology had managed to integrate the data – or at least part of that data – directly into EHRs (67%), but there is clearly still a long way to go. Only 8% of the respondents said that they were able to incorporate all of the data captured by mobile technologies into electronic health records. Healthcare providers have managed to offer a diverse range of mobile tools to help engage with patients, with mobile health apps proving to be one of the most popular methods used. The HIMSS survey showed that 73% of respondents had implemented app-enabled patient portals, 30% had developed mobile health apps and a further 30% claimed that health apps were currently being developed. The survey did highlight some concerns, in particular with regards to HIPAA and data security. Text communications were being used to communicate with patients by 57% of the survey participants, yet text messages are insecure and unless the channel is encrypted, sending PHI would be a HIPAA violation. The survey data doesn’t show how many of these participants were using encrypted text message services to communicate with patients. However, only 57 percent of respondents stated that their organization had a mobile technology policy in place. A third claimed that a mobile policy was under development, while all indicated that mobile data security was an important part of current and future plans.